K5 Learning is a web-based program that offers activities in the areas of reading, math, and spelling. The instruction is completely independent, and it allows children to progress through the program at their own pace. K5 offers detailed reports for parents, so you can easily check up on what your kids are doing, and you can also schedule lessons and activities for your child if you choose. 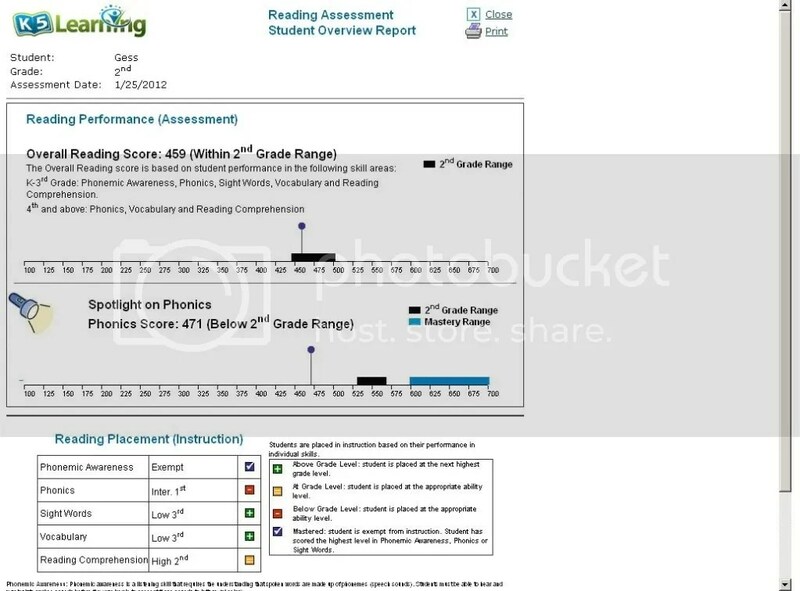 I used K5 primarily for the reading program, which is an area my younger son (5th grade) really needs to work on. I have to say, I was VERY impressed with K5. We started with the reading assessment, which tested my son in the areas of phonemic awareness, phonics, vocabulary and comprehension. After the assessment, I was given a detailed report about where my child performed in each area. The assessment really was on target for where I felt my son is at. He still needs work on his phonics, but his vocabulary and comprehension are defiinitely on target. K5 then builds a program built on the skills your child needs to learn. For my son, this included short phonics lessons, as well as vocabulary and comprehension. My son didn’t enjoy the phonics, but that’s mainly because that is an area of difficulty for him. I thought the lessons were very well done, and they were short (about 20 minutes) which is good. He did however, enjoy both the vocabulary and the comprehension lessons. The vocabulary consisted of a short list of words kids would be able to hear read to them, then have a definition given, and finally, answer a multiple choice question about the word. After that, they get to complete a crossword puzzle using the words. The comprehension consists of stories that kids can read to themselves, or have K5 “students” read out loud. As they read the story, they work on different skills (i.e. fact vs. opinion, cause and effect etc.) Students answer questions, put events in order, form and change opinions etc. based on what they read in the stories. The first story for my son was about samurai’s, so naturally it was a big hit with him!! That brings me to another point, for a reluctant reader, it is SO important that the reading they do interests them. There is nothing worse than trying to get a child who hates to read, to read something they think is stupid!! I did not have that problem at all with K5. My son has loved all of the stories so far, and that makes getting him to do his work SO much easier! I was very impressed with the quality of instruction K5 offers. The lessons on fact and opinion, cause and effect etc. were so spot on! As a reading teacher, I understand how difficult it can be for some kids to grasp those more abstract parts of reading (i.e. inferences!! ), but the instruction K5 offers makes those concepts very easy to understand! As I said earlier, the lessons were short, which was another bonus for my very-active-can’t-sit-still little boy. Usually, I have a hard time getting him to work even on the computer, but, since he knew this lesson wouldn’t last FOREVER (in his eyes 🙂 ) getting him to do it wasn’t a problem. Parents create their own account on K5, so you can log in whenever you want to check on your childs’ progress. There are many different reports, such as overall progress, time on task,and assessment reports. The K5 program assigns lessons to your child based on their assessment, but as the parent you can add lessons as well. NOTE: I was given free access to this website for the purpose of writing this review. All opinions expressed are my own. First of all, the best way to encourage any child to read is to read to them. Yes, even older kids love to be read to. When I was teaching middle school I always scheduled at least 10 minutes of read-aloud for every class. This was a time when kids could just relax and listen, without having to worry about a quiz or a discussion afterwards. I tried to choose books that appealed to my students interest, and often, I would try to read the first book in a series, in order to whet their appetites for more. Many times, students would go to the library to check out the next book in the series in order to find out what happened! Another important factor is linking books to your childrens interests. My younger son enjoys action, as well as true-life biographies. He also loves skateboarding, Star Wars, Legos and mysteries, so I spend a LOT of time looking for books related to that. If I can find a book on one of those topics, he will read it! I love my online library search engine, as it allows me to look for books by topic. I often search my library catalog while also checking amazon.com and the Barnes and Noble website at the same time. This allows me to get a more thorough summary of the book, while also reading reviews written by readers. This helps me to narrow down and choose books that I know will fit my child. I also have another rule in my house: you CANNOT see a movie based on a book until you have read the book itself!! Usually, movies leave out SO MANY amazing parts. I want my children to experience the WHOLE story. So, before seeing the Narnia or Hobbit movies, my kids have to read the books, either with me or on their own. Most of the time, afterwards, my kids agree the book was much better! I don’t know about you, but I love using all-natural products as much as possible! So when I found out I was going to get to review some products from Beeyoutiful, I was really excited!! Beeyoutiful carries all kinds of all-natural hair and skin care products as well as nutritional supplements. For my review, I got to try out the Peppermint Lip BALM and the Hair Shine leave-in conditioner. The Lip BALM is available in orange or peppermint and is made out of grape seed oil, shea butter, beeswax and other essential oils. The peppermint smelled really good, and gave my lips a nice, tingly feeling when I put it on. We are outside a lot, and I find my lips are often dry. I have resorted to using vaseline on my lips in order to keep them from getting chapped. 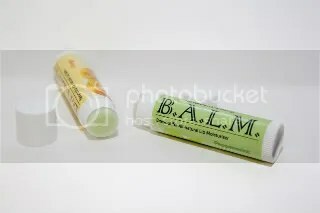 I found the Beeyoutiful Lip Balm to be very effective at keeping my lips moisturized. I also put it on at night before going to bed and when I get up my lips are soft and smooth!! The Lip BALM only costs $3.00, and these usually last a while, so the cost seems very reasonable to me. The second Beeyoutiful product I got to use was the Hair Shine spray-in conditioner. Now, I have to say, I am very cautious about what I put in my hair, so I did show this product to my hairdresser friend prior to using it. She thought it looked great, so I decided to give it a try. As I mentioned before, we spend a LOT of time outside, and also in the water (the pool, the beach etc.) so I am constantly worried about the effect all of that has on my hair. I do try to wear a hat, and rinse my hair as soon as possible after swimming, but overwashing can dry out your hair too! The Hair Shine spray has a nice citrus-type smell to it. It is made out of aloe and the essential oils of lavender, rosemary, and citrus. I used this whenever I got out of the shower. I would just towel-dry my hair and then spray the Hair Shine on and comb it through. My hair definitely detangled easier, and it was soft and shiny!! (My youngest would pat my head and say “mommy, your hair is so soft” 🙂 ). The Beeyoutiful website says the Hair Shine will even work as an all-over body spray and it will help with sunburn and bug bites!! We haven’t had any sunburn lately, but we did try it out on some mosquito bites and it seemed to work very well. Hair Shine normally costs $15.00, but is on sale now for $12.75. That is certainly more expensive than most “XYZ” leave in conditioners at my local Walmart, however, it seems to me that products with all-natural ingredients seem to cost more in general and this price is in line with other natural hair and skin care products I have seen. Note: I received these products free of charge for the purpose of writing this review. All opinions expressed are my own. So I have one child (my youngest boy) who is a Lego FANATIC!! He’s been this way since he was about 3 years old. He can put together one of those super-big Star Wars kits, in a day! And, he is constantly building new creations of his own (“Mom, come look, I have the Eiffel Tower in my room!”). So of course, this boy has been waiting to the grand opening of Legoland Florida since he first read about it in a Lego magazine….a few years ago!! This was the year of the big grand opening, and naturally, all we have heard at my house is “When are we going?”. The thing is, Legoland is theme park. And theme parks are expensive!! Imagine my surprise, (and my son’s joy), when I found out our homeschool group was putting together a Legoland field trip, and the cost was only $5.00 a ticket!!!! Evidently, since this is their first year, the park was offering special field trip rates to educational groups. We signed right up and began counting the days!! Let me just say, the park itself is amazing! I really had no idea the things that could be done with Legos!! They have this whole “mini” world with scaled Lego models of places (like NYC, Vegas etc) and things (like the Space Shuttle and Nasa!!). There are so many moving parts and such amazing detail, you really need more than one trip to soak it all in. Needless to say, my son got lots of inspiration from this part of the trip! The rides were also really cool! I was worried my older son (age 13) would be bored, because he’s not that into Lego’s anyway, and I was worried the rides would be aimed at little kids. However, I was pleasantly surprised. The roller coasters were fun for everyone, and they have cool playgrounds, shows, and other rides that were a lot of fun too. I honestly think my oldest had just as much fun as his brother and his friends!! My son and the other K-6 students also go to participate in a Physics Workshop as part of the Lego Education Program. They built solar powered cars!! The best part of the trip for me was a visit to the section that was preserved from the old Cypress Gardens theme park. As a Florida native, I have fond memories of visiting this park with my grandparents as a child. The gardens and buildings were so beautiful. Cypress Gardens shut down a while ago, and I was interested to see how Legoland would incorporate that into their new park. The Cypress Gardens section contains some of the gardens (of native Florida plants) and buildings from the original park. It was beautiful. My favorite is the big cypress tree in the middle of this section….it is literally huge!! And it’s so beautiful! Legoland was definitely the best field trip of the year, possibly of any year!! We would love to go back sometime, because there is just so much to see and do!! If you have a Lego fanatic like me, it’s definitely worth the trip!! When I first started homeschooling I was asked by many people (including my husband! ), “How will you know how your kids are doing? How will you know if they “measure up”?” Hmmmm….I have to admit, this was a question that sort of stumped me. I mean, as a mom, I think I just KNOW if my kids are getting something or if they aren’t! It was the same in my classroom, I didn’t need a formal test to tell me if my students were understanding something, I could tell by their questions, conversations, and even sometimes, the look on their faces!! Still, it seemed to me like people need more of a concrete answer, so I gave it some thought and this is what I came up with. I know my kids are succeeding when they can do math and get the answers right without asking for my help. I know they are understanding when they can narrate what they have read and they hit all the important points. I know from the questions they ask me if something is confusing to them. I can tell from our conversations if there is a concept I need to review with them, or if I need to push them to go deeper with that concept. I can compare samples of their writing after each quarter of the year and see where they have (or have not) grown. And yes, I can also do testing, which we do once a year. I don’t use these scores to measure definitive success for our homeschool. Instead, I see them as a “jumping off point”. I do compare scores from year to year to look for growth, but I also compare the scores against what I have seen in their work , to get a bigger overall picture of where we are at. Most of the time, the test scores confirm what I already know. I do use them to help identify areas I want to work on for the next year, but they are not the be all and end all of our homeschool success by any means! There are a few more important ways I tend to measure success. Of course I want my boys to grow academically, but to me, it is so much more important that they grow in their character. Each year my goal is for my children to deepen their relationship with the Lord, to mature in their relationship with each other. As they grow older, I want to see them make God-honoring choices in their lives, and grow to be men who know and walk in His way. This is a little harder to measure, as there is no written test for it!! I guess I could say I feel we are successful when I see my boys reading their Bibles and keeping their own prayer journals. When they make decisions that reflect what they have read in the Bible, it makes me happy. When I see them volunteering in church, and helping others, I think we are being successful. Of course, a personal relationship with God is one both of my children have to choose, and I know my husband and I can do all the right things to set them up for that, but ultimately, it is their decision. For now, we just try to encourage their relationship with Him and pray that He will lead us in raising Godly men. If we do that, than I will say we have been successful! Do you have a child who has so much to say, but struggles desperately with writing? Are they an older student who still spells written words phonetically? I do! My 5th grader is full of great ideas and loves to tell stories. He is also excellent at narrating back what he has read, however, when it comes to writing words on the page, the tears come out. Spelling is very difficult for him and he gets VERY frustrated when trying to use a dictionary to look up words. Usually he either asks me to spell it for him, or he just gives up. Fortunately, I got to review See-N-Spell, which was created by the people who make See-N-Read reading tools. It has been a huge help to my son with his writing. The See-N-Spell quick reference guide is very easy to use (much simpler than the various dictionaries I have at home!). All of the words are organized alphabetically, so as long as the child knows the letter the word starts with, he can turn to that page and find the word. Each page has multiple words listed by part of speech, and at the bottom are common homophones (i.e. tail and tale) with a definition of each. This is great when a child is trying to figure out which word to use. At the back of the book there are pages of commonly misspelled more difficult words also listed alphabetically (i.e. synonymous, outrageous etc.). There are also pages for kids to write their own “special interest” words that they use as well. The first day we used See-N-Spell, I showed it to my son and went over how it was set up, and he took it for there. We keep it handy on our homeschool table so he can grab it whenever he needs it. I’ve found him using it for all types of writing, both formal writing we do for English, and also for stories he is writing, things he wants to write for history, science and so on. It has really cut down on a LOT of his frustration when it comes to spelling! I will note, this is NOT designed to be a spelling program, just more of a reference guide, but it suits that task perfectly. Also included with See-N-Spell is one of the handy See-N-Read reading tools! I LOVE these things. I used something very similar in my classroom when I was teaching. They are GREAT for helping struggling readers track text as they read. Often times, my students with disabilities and readers who were struggling had a hard time keeping track of the words on the page as they were reading. It was like the letters were “swimming across the page”. They would usually lose track of where they were, and have to go back and reread over and over. Needless to say, this made reading very frustrating and NOT enjoyable at all. The See-N-Read reading tool helps with this. The student places the tool over the page they are reading, and each line they are currently on shows up in the clear bar on the tool As the student reads, they simply move the tool down the page. It keeps the kids focus on the line they are reading, so they are not distracted by all the rest of the print/pictures on the page. It is also another thing that is VERY easy to use!! **Note: I was given a free copy of this program for the purpose of writing this review. All opinions expressed are my own. Teaching your children at home is not the same as (nor should it be the same as) teaching 30 kids in a classroom. As a former teacher, I had to move from having everything scheduled to the last second, thus draining the flexibility and joy from our learning, to a more relaxed approach. It’s perfectly okay to not always finish everything you had planned for the day, in fact, I think it’s good for kids to learn that in life, you have to be flexible. Things will NOT always go as planned, and learning how to adjust “on the fly” is an important life skill. You don’t HAVE to join every possible homeschool group/co-op etc. that you can find (unless you want to). Honestly, a few well-chosen and enjoyable activities will give your kids PLENTY of socialization. Children are in fact, naturally sociable creatures, and if you just let them be and give them chances to meet people, they will be just fine. There is more to curriculum than just textbooks. Don’t be afraid to step outside the box!! At the same time, if textbooks work great for YOU, then use them!!! It is, after all, YOUR homeschool and you know what suits you and your kids best. On that note, do NOT keep comparing yourself to the other homeschoolers you know. It is very likely that what you do will be very different from what they do, and that’s okay. The point of homeschooling is to make your homeschool reflect the needs of your kids. If all homeschools were uniform, then we would be no different from public schools! Be aware that each of your kids has their own style of learning, and just because something worked great with child A, it may not work for child B.
Homeschooling is a huge responsibility, and for someone like me, that can be stressful. I remind myself daily to “not sweat the small stuff” and just enjoy the time with my kids. I know they are learning the “book stuff”, but to me, the “life stuff” is what’s most important.